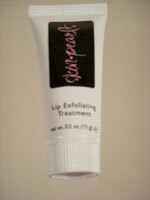 Smoothing treatment for soft, lush lips. Fine-grained crème sloughs away dulling, dry skin with a Mixed Fruit Acid Complex. Refines and resurfaces, so lipcolor won't feather or crack. Apply to clean lips. Allow to dry. Gently rub back and forth over sink to remove dead skin and reveal the soft lips you were meant to have.